A wide-spreading, creeping and rooting herb which often forms large or extensive, matted patches. Stems slender and much interlaced. Leaves: Variable in size, 4-12 mm by 3-13 mm, more or less rounded with a few rather coarse teeth around the margins. Flowers: White, 7-20 mm long, produced singly on slender stalks from 2-6 cm long. 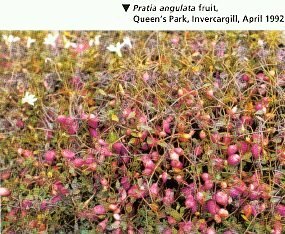 Fruits: Magenta or purplish-red berries are rounded or oval and 7-12 mm in diameter. 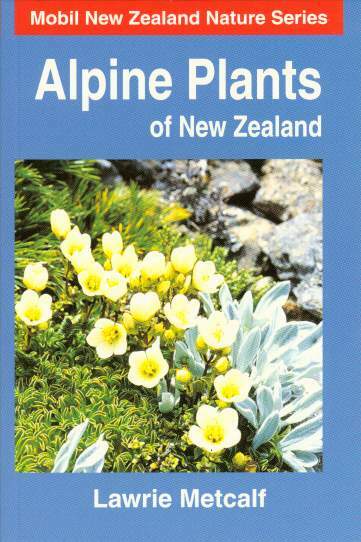 North, South and Stewart Islands in lowland to low alpine regions throughout. Sea level to 1300 metres. 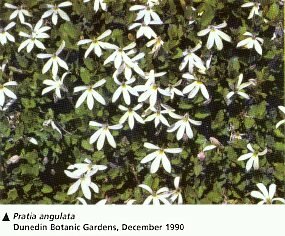 Common in damp situations in subalpine grasslands, banks, streamsides, open forest and herbfields. Identification: Grows in a wide variety of situations, and easily recognised because of the way the flower is split along one side so that the five petals (corolla lobes) are unevenly spaced around it. Not infrequently, ripe fruit can be seen on plants at the same time that they are flowering. Flowering: Between October and April.